Only 7 ingredients for this gorgeous snow white roll cake with white chocolate mousse filling. The secret? Cake mix and 2-ingredient mousse filling! This post has been sponsored by MARS, Pillsbury, and Ziploc. All opinions are mine alone. Every holiday dessert table has room for classics and newfound favorites. But I get you. You don’t want anything complicated. You want festive and beautiful dessert that does’t require half of your pantry and/or entire day in the kitchen. Is it really possible to make something so elegant and delicious with just handful of ingredients? Oh yes, you can! Good news: sophisticated doesn’t have to be complicated. And this gorgeous snow white roll cake is just that! Effortlessly beautiful and quick to make. But the look isn’t the selling point here. You’ll fall in love with it from the first bite! Forget the usual dry and tough sponge cake, we’re talking unbelievably light and tender crumbs with delicate flavor. And did I mention you’ll only need 7 ingredients?? The secret is CAKE MIX! 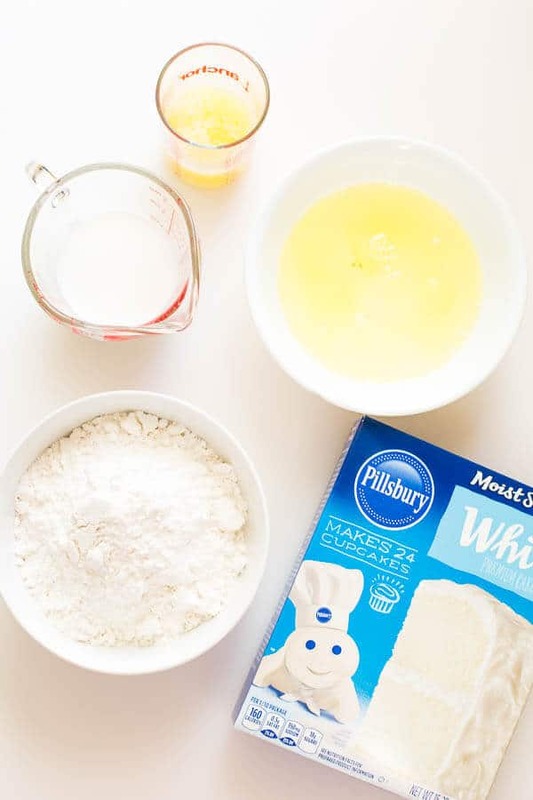 We’ll make the sponge cake with Pillsbury Moist Supreme white premium cake mix. Then we’ll smear nice n’ thick layer of fluffy white chocolate mousse filling before rolling it into flawlessly perfect log. And by log I mean flawless roll cake of your dreams! It’s so beautifully white and melt-in-your-mouth light! 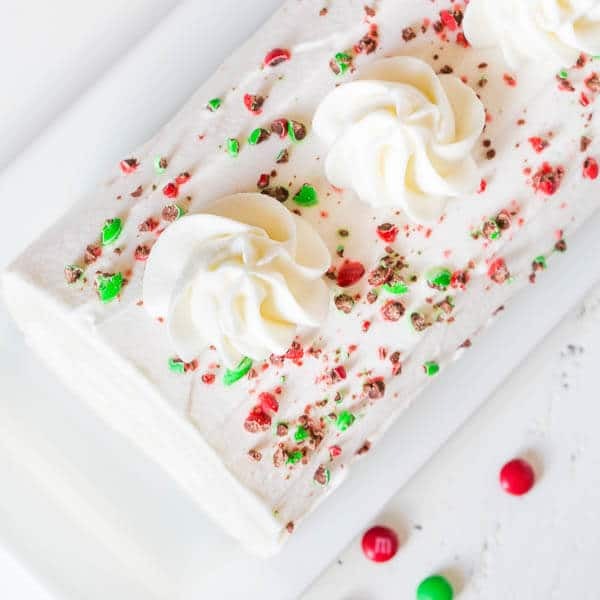 Sprinkle of crushed M&M’s Holiday minis on top adds perfect festive look that I absolutely adore. Oh and that little bit of added crunch is divine! But before you jump into the kitchen for the test run (looking at you, my fellow baking addicts), I need to address couple of things. Roll cakes require elastic sponge cake that can be rolled into a log without breaking into 5 pieces. And following the directions on the back of the cake mix box won’t get you there. Unfortunately… I know this from experience. Whipped egg whites add volume and elasticity to the batter. 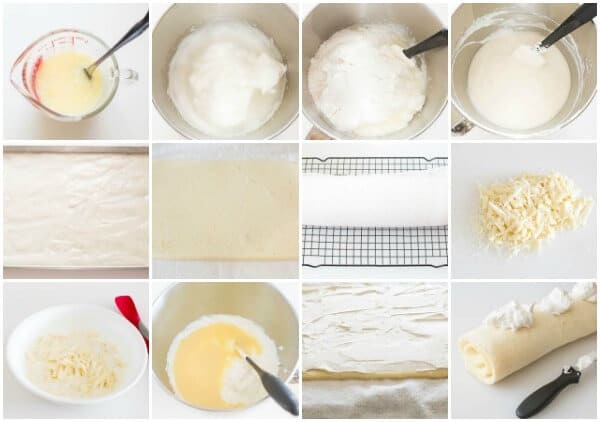 This’s crucial step for fool-proof roll cake that doesn’t break. Instead of water and oil, we’ll use milk and melted butter for flavor. Though you could use egg yolks, we’ll omit them here for a snow white cake. The day I decided to work on this recipe wasn’t a good day. Like not good at all! Nothing was coming out right! Pile of broken cake layers grew on the counter, a sad bowl of soupy filling got pushed aside, and I accidentally whipped the cream into a butter. One of those days, I guess! But I learned valuable lessons from all the failures that day and wanted to share them with you. Elastic sponge cake is all about correct ratio of dry ingredients vs eggs and liquid ingredients. Be patient when working with whipped cream. DON’T add anything warm into it, unless you’re going for a sweet cream soup. And at the end of the day, it’s just baking! Take your time, follow the directions and step away, if needed. When I brought this cake out to the ranch, everyone LOVED it! I don’t think it lasted 5 minutes. I heard lots of ohs and ahs about the beautiful presentation, and even more compliments on the taste. Just seeing everyone enjoying the cake made all the hard work worth it. And look! 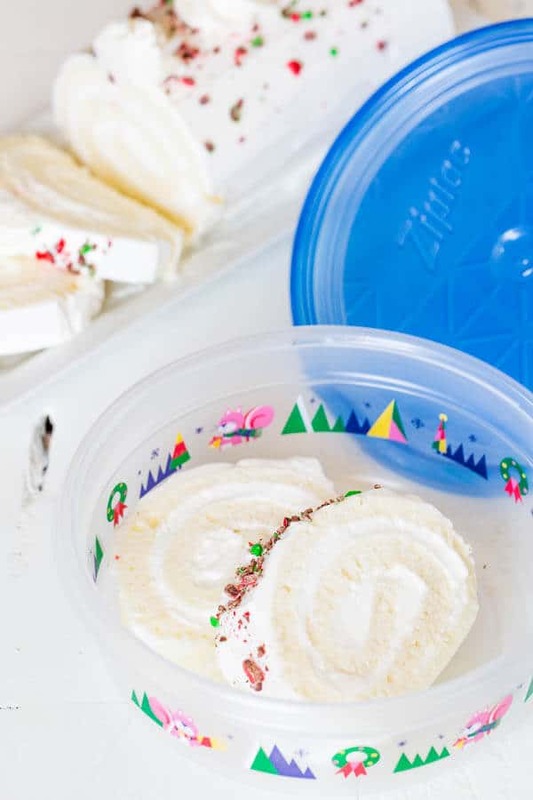 ↓ That cute container from Ziploc below is super convenient. It’s perfect for sharing holiday treats with neighbors and coworkers, and sending leftovers with your guests after a holiday dinner. And they also have special holiday Ziploc bags perfect for sharing holiday joy. Hope you found an inspiration for your holiday dessert table. Thanks for reading! Preheat the oven to 350°F (177°C). Line a baking sheet (16.5 x 11.38 x 1 inches) with parchment paper, or silicone mat and spray with cooking spray. In a glass, mix together milk and butter. In a mixing bowl with whisk attachment, beat the egg whites until soft peaks form. Add milk and butter mixture and dry ingredients into the beaten egg whites. Using a spatula, carefully fold the batter until smooth. Pour the batter into the prepared baking sheet, and spread it evenly all over the sheet, using an offset spatula. It’ll be thin layer, which is exactly how we want. Bake for 12-15 minutes, or until inserted toothpick comes out clean. The cake looks lightly golden, but not browned. 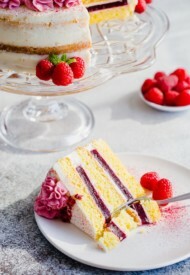 While the cake is baking, prepare a lint-free kitchen towel on a flat surface and generously dust with powdered sugar. When the cake is done, carefully invert the cake onto the prepared kitchen towel and tightly roll the cake from the short side, while still warm. Cool completely on wire rack for about an hour. To prepare the filling, microwave ¼ cup of heavy whipping cream until hot, about 30 seconds. Add cooled white chocolate mixture into the whipped cream and carefully fold until well combined. Once the cake is completely cooled, carefully unroll it. 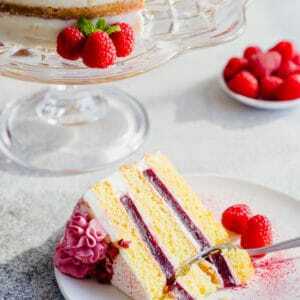 Generously spread white chocolate mousse on the cake, reserving about ½ cup of filling. Spread thinner layer of filling on outer end of the cake. Then tightly roll the cake. 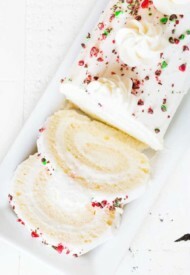 Spread the reserved mousse on the outside of the roll and cut the ends off. Sprinkle some crushed M&Ms for festive look. Refrigerate until ready to serve. The cake is best when served the same day. Leftovers can be refrigerated for up to 3 days. I made this cake Christmas morning. It was beautiful and delicious. I brought it to my son’s for dessert and everyone loved it. My son that lives at home was looking for the leftovers so I’m making it again today. Thanks for this great recipe. Epic fail to say the least. I didn’t realize you weren supposed to use the WHOLE cake box.. icing also I beat after adding the chocolate and it curled and turned into a wet soupy mess. Hi, Lesly. Sorry to hear yours didn’t turn out. Hi there! I made this super yummy delicious recipe. I used 3 scoops of 1/2 cup of cake mix. I used my jelly roll pan, and the cake was super duper thin and broke after every roll. I made it just for my family, so they didn’t care about cracks or looks – they loved it! 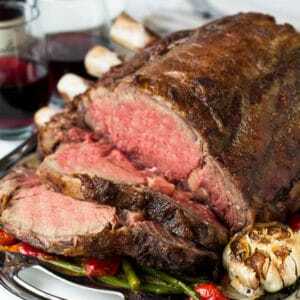 Id love to get this to recipe to roll up thick and beautifully like yours – any suggestions? Thanks for your feedback, Karen. Sorry you didn’t like the cake. Hi, Connie. I don’t recommend freezing this cake. In the recipe for the Snow White Cake Roll, I have a question about the mixing butter with the milk. Am I to melt the butter then mix it with the milk, or melt with milk and for how long? Hi, Sheila. Yes, first melt the butter and then add it to the milk. 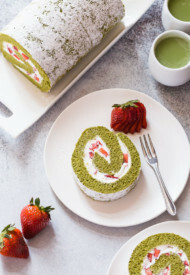 soooo ive been looking for an easy green tea swiss roll recipe. 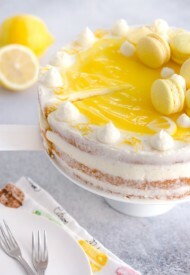 cant find one :/ do you think this recipe would work with adding some matcha powder to the white cake mix before baking? im going to try it out to test for sweetness/bitterness but id like your opinion and any input/thoughts you (or anyone else, for that matter) may have. Hi, Simone. Sure you can definitely try adding a little bit of matcha in this recipe. Though I’ve never tried it myself, I don’t see why it wouldn’t work. I also have this match roll cake recipe, you maybe interested. Check it out, and please let me know if you give it a try. My baking sheet is a little bigger than recommended should I change the recipe a little or is there a way to make my pan smaller with stuff I have around the house? Hi, Jessica. Hmm, how big is your pan? Maybe you can fold a foil around the edges? Oh no, I’m sorry to hear your trouble, Starfire. I saw your photo you sent too. I know you said you measure exactly, but may I know if you used cups, or weighed them on a scale? Also, you used large eggs, right? Elastic sponge cake is all about ratio, and I wonder if it was any possibility the ratio got off. This cake is Superb!!!!!! I made it last Christmas and going to make it again this year. Might just become a tradition. MMMMMM! LOVE IT!! Yay, so happy you’re loving the cake, Christina! Thank you for your feedback. Hi, Sheila. Basically, you can measure the cake mix either by cup or scale. 1 1/2 cups of cake mix equals 215gr. I provide both measurements, because not everyone has cups. If you have kitchen scale, use the scale. I prefer scale over cups in baking, because it’s more accurate measurement. And yes, you can totally color your filling with Christmas colors, and white chocolate ganache would be beautiful. I’d pour the ganache after the iced roll has been chilled for a little bit. I have never done a roll cake, but I really want to try it! I was thinking a little peppermint extract in the mousse with a bit of red food coloring, and crushed candy canes on top might work too. What do you think? Hi, Toni! You’ve got a fabulous idea! 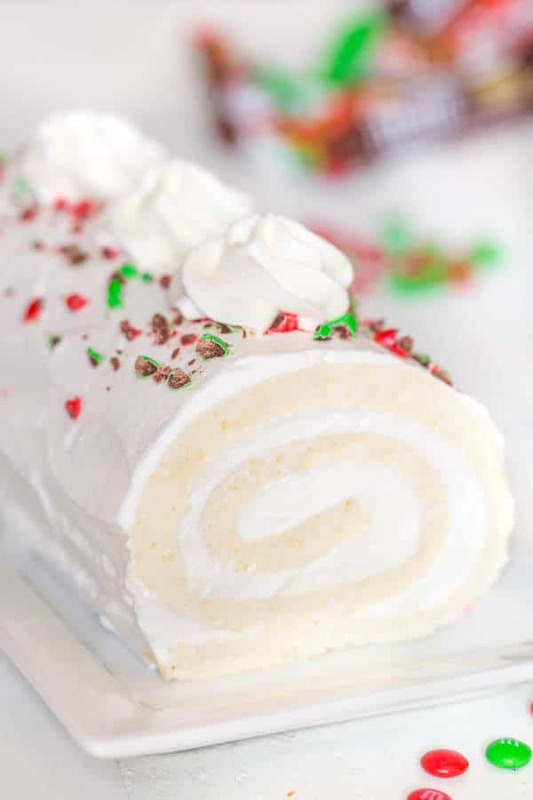 I love the peppermint spin on this roll cake. Hope you’ll love making a roll cake. Let me know how it goes, if you try it. Thanks! Mine cracked in half when I rolled it the first time. What do you think I did wrong? I am letting it cool and will just go with the cracked version, but I was hoping to fix it if I did it again another time. Thank you! Hi, Jennifer! Sorry to hear you got a crack. Did it break only on one place? If so, you can totally roll it up anyway, no one will know. 🙂 How did you measure the cake mix though? By a cup measurement, or weight? If you measured it by a cup, it’s possible you’ve got a bit too much dry ingredients vs wet ingredients/egg whites. It’s just so easy to over-measure with a cup. Hope you have a great holiday, Jennifer. Merry Christmas! I feel your recipe does not come off clear. If the powder sugar is for dusting only then that should be listed right beside it “2 to 3 tablespoons of powder sugar for dusting only” I’m sure a lot of people besides me was Unsure about the powder surgar is to be mixed in with the cake flour. Directions need to be clearer. Hi, Deborah! Thank you for your feedback and sorry for confusion. I updated the recipe per your request, it makes perfect sense. Hope you’ll try the recipe and enjoy the cake. Let me know if you have any more questions. Merry Christmas! I plan on making this tomorrow for my family party. I’ve made plenty of rolled cakes before but never this way. I’ve also never made a mousse before. So my question is if I don’t have a whisk attachment for my hand mixer what’s you best opinion on what I should use when I need to create those stiff peaks? Also any other advice you have while making this if I don’t have a stand mixer. Hi, Lynn. You don’t have to have a stand mixer, any electric mixer will work. Actually, even just whisk will do the job, it’ll just take a bit longer to whip the egg whites and heavy cream to hard peaks. Quick tip: cold cream whips quicker, so use the cream straight out of the fridge and if you have time chill the bowl too. However, egg whites whip better while at room temperature. 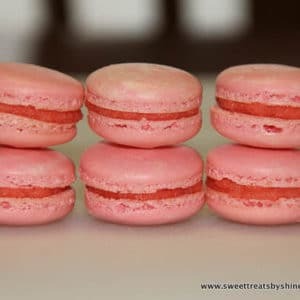 If you haven’t already, please the post above the recipe, I’ve included more tips and lessons I’ve learned while creating this recipe. I hope you and your family enjoy this cake and have a fantastic holiday. Merry Christmas!! Hi every since I saw this on Pinterest I’ve been thinking about it! My brain could not stop thinking white chocolate!!! So I’m in the middle of trying it out the cake seemed to turn out good I’ll let to know what my family thought. I’m afraid now there will not be enough!!! I’ll let you know. Question, can I do this with dark chocolate too? Cake and chocolate? I think it would be nice to have a choice. Happy holidays! Hi, Alyce! So happy you tried the recipe. Hope everyone enjoyed it. Yes, dark chocolate is totally fine. In fact, I modified my dark chocolate mousse from this cake. Let me know how it turns out. Merry Christmas and Happy Holidays! Hi, Brenda! I had more than enough frosting to do inside and outside of the cake and even those little top decorations with the recipe I’ve written. 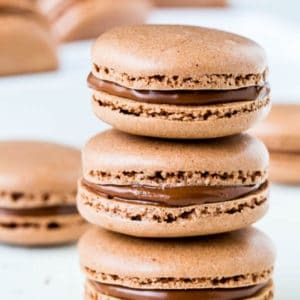 Can you use white chips instead of baking chocolate? Yes, you sure can, Di. My cake came out awful. It was too dry. Not over baked not spongy enough. Not near enough filling for the outside to look like yours. Looked like a dried up little frosting cake. Di, sorry, your didn’t turn out well. I have no idea what could have went wrong. Did the cake roll ok, or cracked? As for the frosting, I’m so surprised, I had more than enough frosting and did those little extra decorations on top. So I’m baffled. What size baking pan did you use? And did you change anything? Going to try this today …but I have a question can u do this to all the cake mix just to do a short cut lol ??????????? Hi, Lily. Yeah, I think you can use any cake mix, just as long as you keep the ratio the same. Let me know how it turns out. 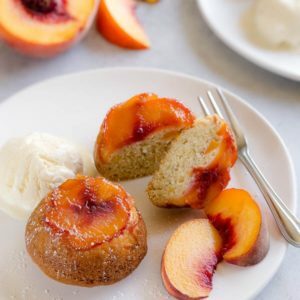 Can this cake be made ahead of time and then frozen? Hi, Gloria. No, I wouldn’t recommend that. So If I need to make 2 rolls do I need to double this recipe or is it for 2 rolls already?. Yes, you’ll need to double the recipe. The recipe makes only one roll using half of the cake mix. Thanks for reaching out, Nancy. And hope you’ll love it. Let me know how it turns out. I really want to try making this but , what kind of banking sheet pan do I need ? I am in the middle of attempting to make this. Thought it would be a piece of cake (no pun intended) until I realized that I had nowhere near enough batter to fill the cookie sheet! The directions say to pour onto the baking sheet but it says nothing about if we are supposed to spread it evenly… because I had huge spots where the batter would not reach! Hi, Kathryn. I’m not sure I understand what you mean by “huge spots where batter would not reach”? You mean it’s empty? If so, yes, go ahead and spread the batter evenly until the pan is completely covered. The batter doesn’t have to be in thick layer, just as long as it covers the pan. And sorry for confusion, I’ll update the recipe to note that. Thanks for your feedback! And please let me know how it turns out. 1. Do you recommend making a trial ahead of time? Or do you feel a good cook can pull this off the first try. 2. How do you feel about crushed candy canes vs the mini m & m’s? Hi, Rosemary! So happy you’re planning to make this for your family Christmas. If you’ve never made a roll cake before, it’s a good idea to give a trial run. But if you’re confident and you follow the recipe, you should be able to pull it off. Crushed candy canes would be festive, but I think M&Ms would compliment the cake better flavor-wise. Let me know it turns out, or if you have more questions. Thanks!! This is seriously like the cake of my dreams! Light and fluffy with a creamy cream filling…. I’m already daydreaming about putting this in my mouth! Also, my inner 5 year old REALLY likes that this cake is named after a Disney princess, haha! I didn’t even think of that, Luci. Haha Too funny! Thanks for visiting! I love these kinds of jelly rolls – they’re so festive — and that all white look reminds me of snow drifts! Lovely! Now that you said that, it does look like snow drifts! Haha Thanks, Lisa! Such a gorgeous roll cake! Love how easy it is with the mix and the sprinkling of m&ms on top. I particularly appreciate your tips to make the sponge cake without breaking and that is quite the festive container. This roll cake almost looks too pretty to eat! I’ve always been daunted by rolls cakes – my pumpkin one always cracks. I’m going to try this one with your tips for a crack-free cake. Pinned! It’s all about the correct ratio of dry vs wet ingredients and whipping the egg whites. Hope you’ll get your pumpkin roll cake just right. Thanks for stopping by, Tara! This cake is gorgeous! It reminds me (in a good way) of those chocolate Swiss rolls I used to eat when I was little. Sounds so yummy! !